Join me, if you will, in a little celebration amidst humanity’s ever increasing swathes of doom and gloom. Because, despite the myriad ways in which our species seems intent on ruining not only itself but also its habitat, there is, like tiny saplings poking their heads through the dry earth or sunbeams breaking through the clouds, still hope. That hope lies in the people who refuse to sit back and watch as we chart an untenable course into oblivion. Not world leaders, nor social commentators, but ordinary people like you and me. What qualities do they possess that many of their fellow humankind do not, or choose not to cultivate? Belief it doesn’t have to be this way. Compassion for their fellow men and women. The desire to act, to help, to make a tangible difference, no matter how small. The Worldwide Tribe – Words can’t describe my admiration for Jasmin O’Hara and her small team of friends and family who have been working tirelessly in recent weeks to raise funds and gather supplies for the refugees in Calais. Their Facebook page details their regular trips and interactions with the refugees, and donations to the cause can be made here. Serve the City / Gare du Nord – Food for Friends – I recently found out about Serve the City, “A movement of volunteers serving cities in practical ways & inspiring people to be givers in this world,” who “believe that many people doing small things together can make a big difference in our world.” The Brussels website details lots of different volunteering opportunities that I am keen to check out, including the Gare du Nord – Food for Friends project, which meets weekly to distribute food and supplies, and provide a listening ear, to homeless people, including those caught up in the current migrant crisis. Solidare-IT – A crowdfunded project I have recently come across in Brussels, which aims to “connect people who need some help with people who can and want to help…[facilitating] the exchange of solidarity.” The project is scheduled to be up and running by the end of this year, and I’m so impressed with it I have offered my communication services for free – a small personal contribution to a fantastic cause. Mark Bustos – I’ve mentioned him on this blog before, but he is more than deserving of another mention. A New York-based celebrity hair stylist who gives up his weekends to provide free hair cuts (and care packages courtesy of his girlfriend, who goes with him) to the homeless. Follow him on Instagram – markbustos – his updates make me smile every time. It is people and projects like these that inspire me to do better, to be better. It’s all too easy to pass the buck and say the issues that society is currently facing are too big for ordinary people to solve. But if not us, the ordinary people, then who? The politicians? Excuse me while I choke on my latte. No. The only way to save our species is by looking outside ourselves and starting to save others. If that’s not the true essence of humanity I don’t know what is. And if the rest of us ordinary people don’t get with the programme soon it will be too late to find out. 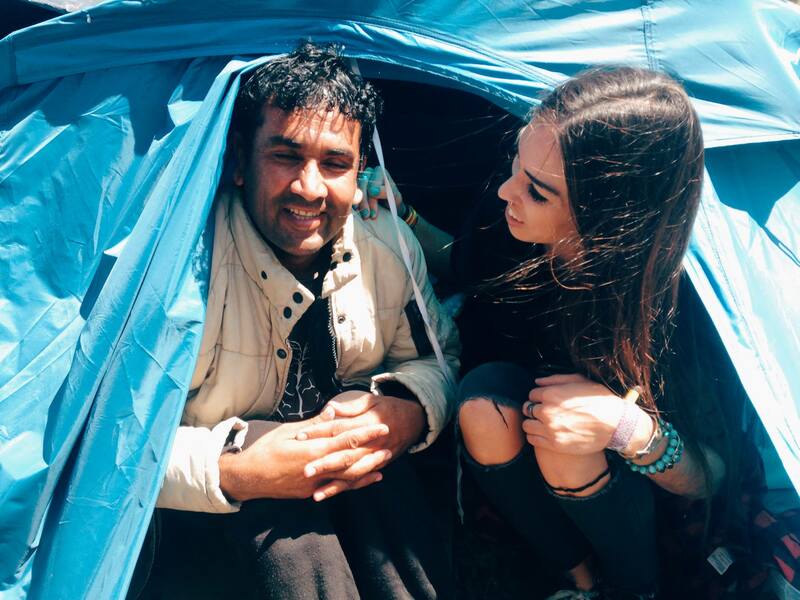 Jasmin O’Hara from the Worldwide Tribe on one of their trips to the Calais migrant camp.